Bikes & Bagels Commuter Celebration – Ride or Bike in! It is that time of year: the sun is out, and the days are getting longer. Time to tune up your bike and start riding. May 18th is the 8th Annual Bikes and Bagels celebration and this year we will be at three locations. Join Commute Seattle to celebrate biking in the city! Swing by, on foot or bike, to celebrate your active commute with a bagel and coffee on your way to work. 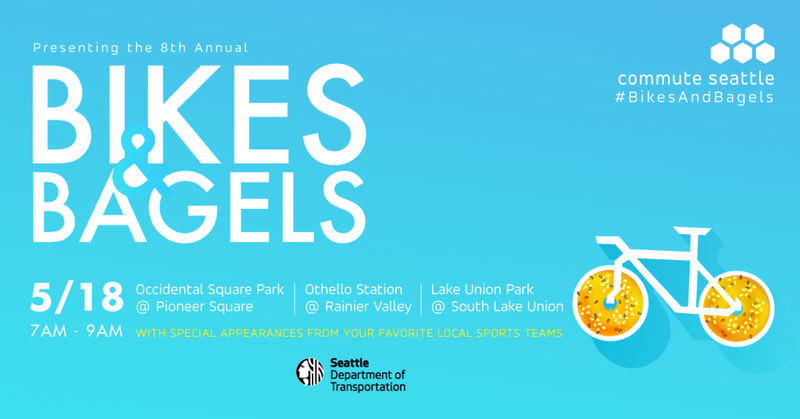 Grab a goody from Seattle Bagel Bakery, pick up your promo code from a bike share company, sign-up to win prizes and meet your favorite local team mascots!